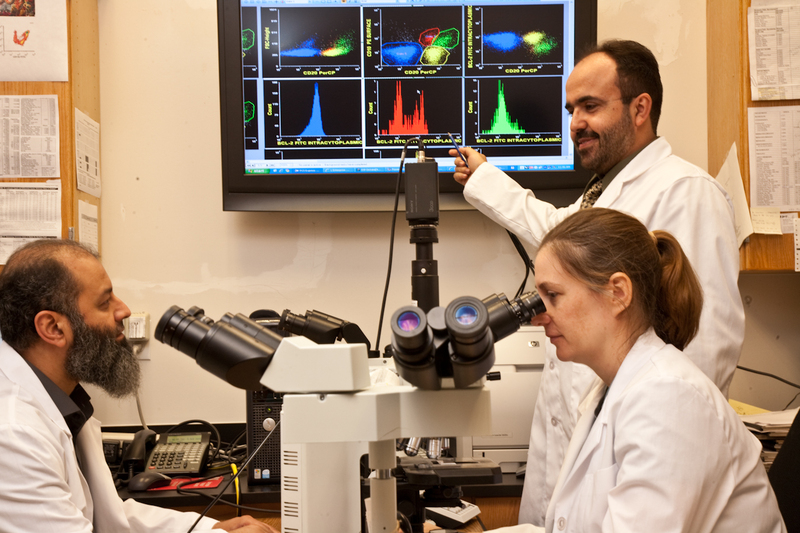 Utilizing leading-edge technologies and laboratory facilities, the Department of Pathology, Immunology and Laboratory Medicine mentors next-generation pathologists with hands-on instruction in pathology theory and traditional microscopy, along with molecular biology, flow cytometry, image analysis, immunohistochemistry, protein biochemistry, monoclonal antibodies and cytogenetics. While long-established disciplines are taught, we recognize that pathologists of the future will regularly renew their knowledge base through a process of organized and self-directed continuing-education experiences. This process begins during residency training and continues throughout a pathologist’s career. Anatomic Pathology (AP): In learning this discipline, macro- and microscopic examination of tissue is performed and linked with molecular analyses by morphological methods. Clinical Pathology (CP): Patient care is delivered through performing chemical or molecular analyses, microbiology, blood-banking, tissue-typing, and other laboratory methods. Residents and fellows benefit from the balanced strength of our six divisions and gain broad experience at one of the most complete medical centers in the country.